Daily Spirit & Word: 739: Motivated By Love. Pentecost Prayer Week: Day 3: How The Holy Spirit Moves You. If it doesn’t affect your hands, feet, and thinking, it isn’t Christianity. After you’ve trusted Jesus as Lord and Saviour something happens to your heart, mind, will and emotions. It’s all just a part of the RENEWAL taking place within you as the Holy Spirit takes up residence. However, unlike the UK Government that’s only elected for five years, He’s with you forever. One of the personal PROOFS that you are a Christian is to look for this evidence within yourself; “Am I changing day by day to become more like Jesus?” If not then what might have happened is that you’ve just gotten ‘religious’ rather than saved. Because if it doesn’t affect your hands, feet and thinking, then it isn’t Christianity. The indwelling Holy Spirit produces the fruit of righteousness within every Christian. The indwelling Holy Spirit FILLS you with God’s Love: that love will motivate you. It’s not just so that you can feel good or know that God loves you. You should know that anyway, but His love compels us to do stuff for God daily. The indwelling Holy Spirit MOVES us to obey God’s will. We should exhibit in increasing measure; Love, Joy, Peace, Patience, Kindness, Goodness, Faithfulness, Righteousness, Gentleness and Self-Control. 1 Corinthians 13 is all about real LOVE and you’ll know if you are loving God and people more. Jesus summary of the Ten Commandments: Love God and Love Others: The Golden Rule: “Love the Lord Thy God with ALL your heart, mind, soul and strength and love your neighbour as yourself”… You can’t do it in your own strength, you need the Holy Spirit within to make this fulfilment of Jesus command possible. Now, you can put it to the TEST this week. You’ve got an excuse, because it’s Pentecost Prayer Week. So now you can do or practice some of these things. The Holy Spirit is always prompting us to do it anyway. Hands: Do some good with your hands: i.e. Be a practical Christian, let it affect your service towards others. Do more, do nice things for people, especially the people you are praying for every day on your OIKOS list. After praying for them, do something nice; make something for them, take them for a coffee, go for a walk with them, talk with them, ask them how things are going in their life. Don’t just have friends for what they can do for you, but be a friend for them too. If we see that they have a NEED in life, then ask God HOW you can help to solve their problems for them. It might mean you’ll just need to pray more for them or it might mean you have to put your hands into your pocket and give them so of your treasures. Feet: Go the extra mile for others. Go where the Holy Spirit prompts you. Use your feet to avoid areas of temptation by running away. The Bible tells us to flee temptation. We’re praying the Lord’s prayer every day this week and part of that prayer says, “Lead me not into temptation, deliver me from evil”… We can co-operate with the LORD by running away from tempting things. And running towards the areas of His service. Let your feet be fitted with those Gospel shoes mentioned in the Armour Ephesians 6:10-20. i.e. let your feet take you to where you’ll be prompted to share the Good News of Jesus. Thinking: We mentioned this yesterday in regards taking others captive for Jesus, but we must also take every thought captive in our own minds and put them in a strong tower of God’s making. Imprison our thoughts and use our minds to think God’s thoughts. Romans 12 begins with an instruction about having our minds being renewed by the Holy Spirit. We’re not to think or react as the world does. So when someone cuts you up whilst driving, bless them. When someone jumps the queue when your shopping, allow them to go before you. When someone forgets to repay a debit or a loan, let them off, forget about it, cancel their debt. When you see them, tell them not to worry about it. Lending money to people makes them your servant, they are bound to you because of the outstanding debit, so release those captives and let them go. You’ll be like God if you can begin to think like this. Jesus came to set the captives free and if we’re filled with the same Holy Spirit so will we. It will be a JOY to our hearts to let people go. If someone offends you in some way, think about it, forgive them, because God has forgiven you so much. In these ways you can practically change your thinking and have your mind renewed. I’m sure there are many more ways our thinking can be transformed by God’s indwelling Holy Spirit. These are not exhaustive, just some examples. So my friends, today, shall we let the Holy Spirit loose within ourselves and let Him affect our; Hands (service for God and others), Feet (going out for Jesus into this world and fleeing temptation), Thinking (being renewed by what we dwell upon and think about). Because, if it doesn’t affect my hands, feet, and thinking, it isn’t real Christianity. and I’m not really following Jesus. Do not merely listen to the WORD, but be obedient to it. 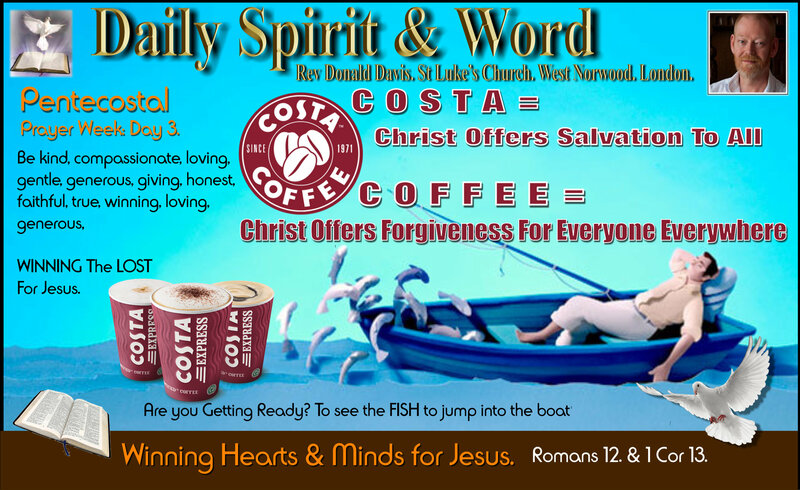 COSTA = Christ, Offers, Salvation, To, All. COFFEE = Christ, Offers, Forgiveness, For, Everyone, Everywhere. 10 A final word: Be strong in the Lord and in his mighty power. 11 Put on all of God’s armor so that you will be able to stand firm against all strategies of the devil. 13 Therefore, put on every piece of God’s armor so you will be able to resist the enemy in the time of evil. Then after the battle you will still be standing firm. 19 And pray for me, too. Ask God to give me the right words so I can boldly explain God’s mysterious plan that the Good News is for Jews and Gentiles alike. 20 I am in chains now, still preaching this message as God’s ambassador. So pray that I will keep on speaking boldly for him, as I should. Let God’s LOVE Motivate You Towards REAL Love. HOW To LOVE Practically: Sincere Active Love. 13 Share with God’s people who are in need. Practise hospitality. DON’T JUST ASK FOR THE HOLY SPIRIT ONCE; KEEP ASKING TO BE FILLED. Luke 11:9-13 (NIV) Heavenly Father Is Longing to GIVE you Holy Spirit. As you seek to serve both God and Others, with LOVE and sincerity, you’ll become aware of the NEED to be constantly FILLED with His Holy Spirit. Jesus knew you’d never be able to do it without His help, so He’s encouraging you to KEEP ASKING and to KEEP BEING FILLED with Holy Spirit. As you PRAY for your OIKOS (Everyone who knows you and that you are a committed Christian who loves following and serving Jesus). as you pray for them all, be practical today, because LOVE must be sincere. Remove your FAVOURITES and LOVE and SHARE Jesus with EVERYONE. Don’t be put-off by outward appearance, sometimes the softest hearts are inside the hardest exteriors. Jesus is offering SALVATION to everyone. I’m praying for my own OIKOS today. LORD fill them with Your LOVE. Move them by Your Spirit. Love let me be a practical follower of Jesus. Let me LOVE in Word, Deed and Thought. Amen.